Fast Times has performed the high-energy hits at numerous venues including AT&T Park, Great American Music Hall, Slim’s, Red Devil Lounge, Pier 39′s Fleet Week Celebration and the 2010 PGA Tour Stonebrae Classic. Fast Times has performed for companies of all sizes, from start-ups to Fortune 500s. Fast Times plays the top dance hits from the 60’s to Today. From A-Ha to Lady Gaga, from The Temptations to Taylor Swift, every song is an instantly recognizable hit guaranteed to get audiences on their feet and dancing. 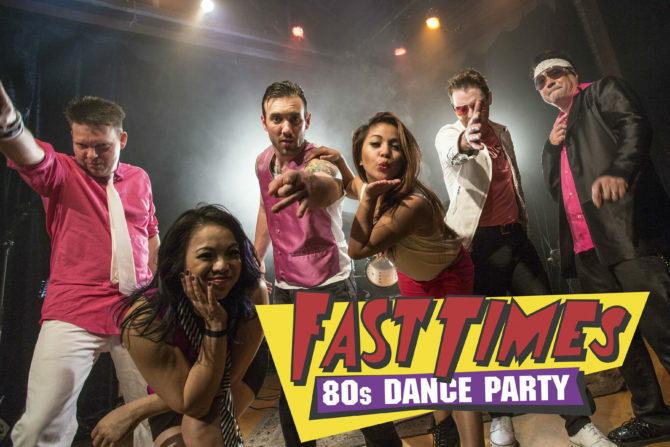 From new wave and synth-pop to arena rock and hair metal, Fast Times plays every song entirely live, with a dance beat that you cannot resist. We can also play an entire event of all 80s music, the ultimate decade of decadence.